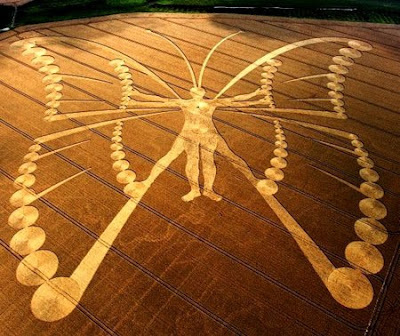 The human figure in the crop circle formation looks a lot like Da Vinci's "Vitruvian Man" or the man you see in the header for the Mayan Prophecy 2012 Blog. In a case of super synchronistic fluttering~by mysticism ... Spontaneous Evolution a book by Dr. Bruce Lipton & Steve Bhaerman ( Swami Beyondananda ) has Da Vinci's Vitruvian Man and a Butterfly on its cover ! The butterfly is symbolic of growth, change and transformation. Psyche (the Greek goddess to whom we are indebted for the root of our word psychology) was the name given by the Greeks to the soul. It was also the Greek word which originally stood for the butterfly. In early Greek art this goddess, as the soul, was represented as a butterfly. 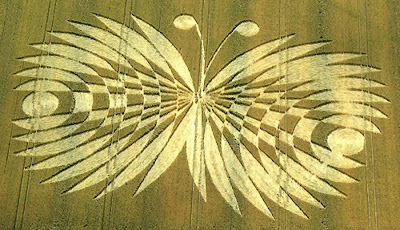 In time the butterfly (psyche) came to symbolise the soul and our word psychosomatic means the effect of the soul, (or the mind) on the body (the Greek word for which is soma). Native Americans see the butterfly as a symbol of joy. Feeding on the flowers they help pollinate, they further spread beauty. Butterflies eyes consist of thousands of individual lenses. This gives them the gift of being able to see a single image clearly. They can perceive ultraviolet wavelengths of light, suggesting clairvoyant abilities for those with Butterfly as power animal. The antennae of the butterfly has small knobs on each end which are said to aid orientation. If an antennae is missing the butterfly will fly in circles unable to find its way. 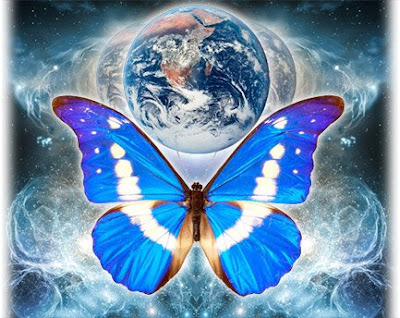 If butterfly is your ally you need to remain consciously connected to spirit at all times so you may fulfill your goals. Butterfly is the symbol of change, the soul, creativity, freedom, joy and colour. 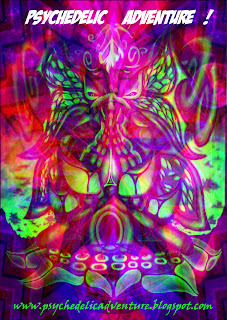 Their power is transformation, shape shifting and soul evolution. They represent the element of air, quickly changing and always on the move gracefully. Butterflies are messengers of the moment and come in a wide array of colours. Studying these colours can help you uncover butterflies message to you. It reminds us not to take things too seriously and to get up and move. They teach us that growth and transformation does not have to be a traumatic experience. It can be joyous. Butterflies possess the ability to grow and change, leaving the safety of their cocoon to discover a new world in a new form without fear, trusting their untested wings to fly without a doubt in their minds. They work through many important stages to become the beautiful creature they are. Similar to the butterfly, we too are always moving through different stages, each equally as vital. It is no good rushing to a particular stage, nor is it good getting stuck at a stage and becoming stagnant. Butterfly is a potent symbol for those considering, or in the throes of, a big change. Butterfly is also one of the most inspiring symbols of the animal world, knowing precisely the time to leave the comfort and limitation of its cocoon, flying freely into the world. Quite frequently, we are not so certain. The cocoon of our thoughts and fears may be limiting, they are also safe and familiar. We can become afraid of what may be outside of our limiting thoughts and belief systems, trapping us and holding us back from ourselves, from our dreams and desires, from our unlimited potential. We can learn how to move on, how to grow from and improve a situation by finding out which stage we are at. This may be the egg stage, the beginning - where an idea is born and not yet reality. The larvae stage is when you physically get your idea going, usually involving preparation such as planning. The cocoon stage entails developing your ideas, project or talent. The ultimate stage of transformation is coming out of the chrysalis, the birth of the butterfly. This last stage is about sharing the colours and ecstasy of your creation with the rest of the world. Remember that we are always evolving, growing and that we are always at one of these stages. Figure out which stage you are at, whether you need more time to complete one stage before being ready going on to the next. Be careful not to rush, nor get stuck either. Not all change feels deliberate, it can be very subtle. Such as losing a job and then circumstances pushing you in to a new direction. There may have been things going on within you, getting you ready for a change subconsciously, that you didn't even recognise. If you are feeling insecure and unsure of what is going on in your life right now, then look back over what has been going on in your life recently or even long ago. Have you ever wished that you had a different job? Of changing career? Are you able to see that on some level your wishes are coming true? I’m sure you will remember the good old saying 'be careful what you wish for..' What you focus on, is sure to manifest. Butterfly can help you see that exiting the cocoon suddenly opens a new door, that there is power in trust and vulnerability. No more than you does a butterfly know whether it can fly, but it opens its wings in perfect confidence, and discovers that their delicacy allow its graceful flight, its dance in the air. When we understand that transformation can be as natural as breathing, when we take ourselves lightly, when we trust in our own untried wings to support us, we learn the message of Butterfly, life itself is a joyous dance. Dance brings us the sweetness of life. The four stages of the butterflies growth are parallel to the development of our first forming a thought to manifesting it in the outer world. Understanding that change can be as natural as breathing. We mustn't be so hard on ourselves, trusting that our own untried wings will bear our weight. This is when we receive the Butterflies gift: life itself is extraordinary and amazing. If Butterfly has found you, take note of the most important issues in your life and see what needs to be changed. If an eco system becomes damaged, butterfly is usually first to leave, as they are highly sensitive to the harmony of the earth. If butterfly finds you and is unwell, hurt or caught, this is an indication that you must stop disturbing the natural design of life and to flow with events in a more gentle and natural manner. 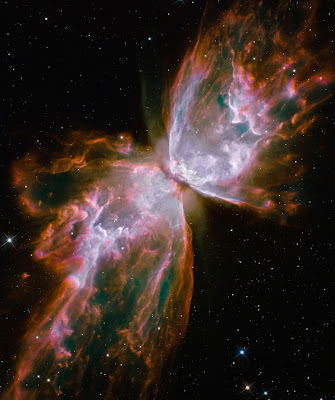 This undated handout image provided by NASA, released Wednesday, Sept. 9, 2009, taken by the refurbished Hubble Space Telescope, shows a celestial object that looks like a delicate butterfly ... ツ ! 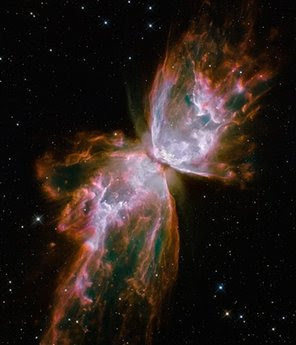 NGC 6302: The Butterfly Nebula ... The bright clusters and nebulae of planet Earth's night sky are often named for flowers or insects, and NGC 6302 is no exception. With an estimated surface temperature of about 250,000 degrees C, the central star of this particular planetary nebula is exceptionally hot though -- shining brightly in ultraviolet light but hidden from direct view by a dense torus of dust. This dramatically detailed close-up of the dying star's nebula was recorded by the newly upgraded Hubble Space Telescope. Cutting across a bright cavity of ionized gas, the dust torus surrounding the central star is near the center of this view, almost edge-on to the line-of-sight. Molecular hydrogen has been detected in the hot star's dusty cosmic shroud. NGC 6302 lies about 4,000 light-years away in the arachnologically correct constellation Scorpius. 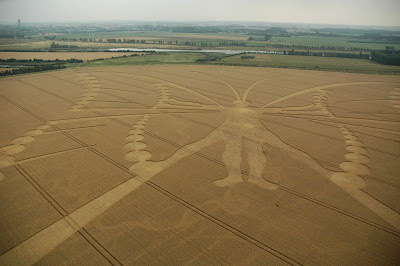 A Magnificent Butterfly Crop Circle appeared at Hailey Wood, near Ashbury, Oxfordshire, UK on July 16th 2007 ! 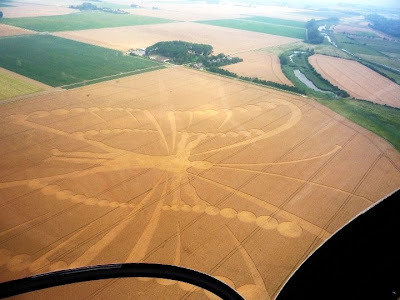 "The Human Butterfly Crop Circle, Netherlands"
The Butterfly : A Symbol of Our Transformation ! "What the caterpillar calls the end of the world, a master calls a butterfly." 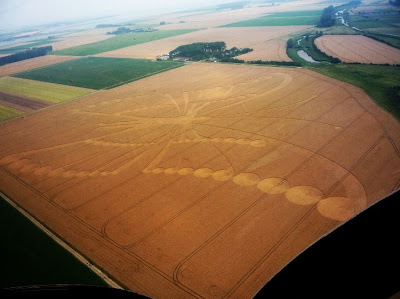 Cropcircles: Secrets and Mysteries of Planetary Dreamers. I've created two short videos about the Butterfly with music, images and aerial shots. Butterflies will make my wish of having a different job or of changing career true? I´ve never heard of that, but you can always try, you don´t lose anything, right? Figura un video donde la presentadora Geraldine, contacta a Ron y un grupo de 100 personas aprox. que se presentan como los responsables de este "Hombre-Mariposa". 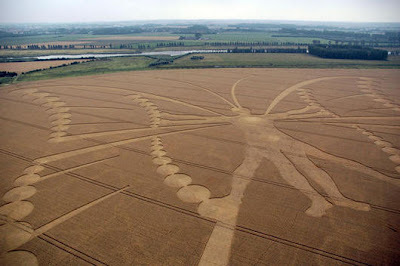 This is the best crop circle I've ever seen!!!!!!! So amazingly artful and so geometrically symmetrical! It's impossible for one with Earthly knowledge to manage to pull it off so gracefully with the people all of a sudden noticing it... like it just too a small moment to make! .... This is seriously extra terrestrially influenced! 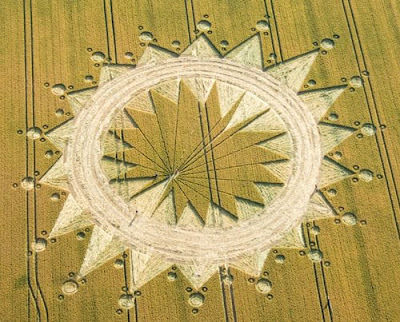 Or perhaps the creator was a really big fan of the the TV show "The Tick" because that crop circle is a spitting image of Arthur. hehe actually, I get the feeling of playfull humor like that in some of these. it seems to be part of the message. transformation joyous and childlike. 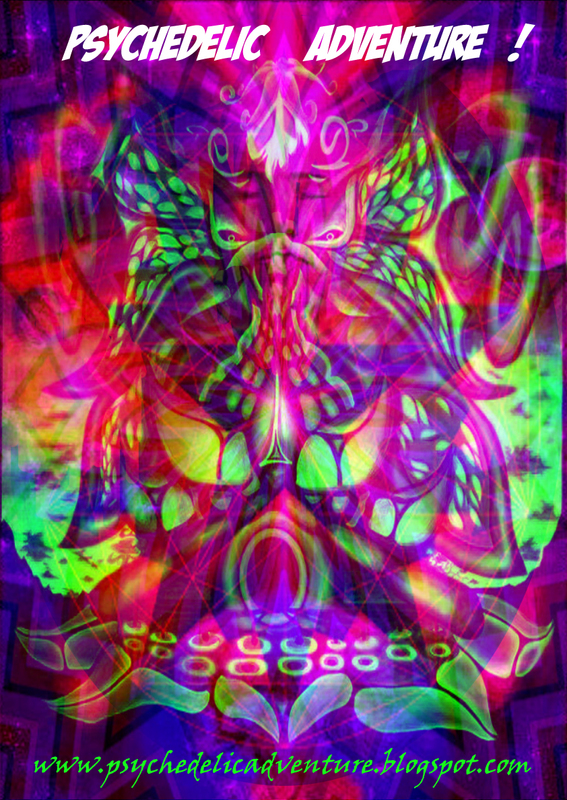 The conscious can feel the changes, but on mass we do seem to be gnawing at the edge of a leaf. Maybe thats it. The Earth is the leaf and we are a billion catterpillars. Not all the catterpillars get to be butterflies though, which worries me. how do i know ? my friends made it. have fun believing in crap-cricles. (Casey). . . If nothing ever changed; butterflies would not exist. . .
May I re-post some of your pictures on my facebook page? My oldest daughter was killed in a tragic accident 3 weeks ago (3 weeks today)and from the time of her passing, we have seen butterflies all over our yard; one little black one in particular. (she always dyed her hair black). Then I found a drawing she had done of a cocoon with a butterfly coming out of it. Very significant for us today. Anyway, I am now very drawn towards butterflies of all sorts as they now remind me of my daughter. If it's okay with you, I would like to be able to re-post some of your pictures.